One of the best sources of information about a company's performance is the customer base. Please take a few minutes to learn what our customers have said about Precision Air. We needed to replace our air conditioner and heater, and we had a firm budget to do it. Several companies had come and quoted us on the job. Precision gave us by far the best price, Tom also suggested the Home Performance with Energy Star program, and combined some additional rebates. We ended up getting much more equipment and services for less cost and for true top of the line equipment rather than the middle of the road others had quoted us. Plus the installation that started literally the next day was super-smooth and quick, saving us from an unbearable heat wave! I cannot begin to express how happy I am with the installation of our new heating & air condition unit and hot water heater by your Precision Air team. I had spent a lot of time researching what company I would hire for this installation. Everything I studied kept pointing to Precision Air which had top level certifications and awards. On any big ticket purchase I would normally obtain 3 estimates, evaluate them, and then choose a company. You were the first company I spoke with and knew that no other estimates would be necessary. Your personal knowledge, professionalism, and friendliness sold me immediately. Your installation team is a tribute to you because they all reflected the qualities and philosophy that you exhibited. Add to that that they were all very respectful. The job your team did was nothing short of phenomenal. It was so good that I received 3 different unsolicited comments from various municipal and state inspectors telling me what a great job your team did for me. When have you ever heard that happen before?! Tom and the Precision team, job well done! I will recommend you all to anyone in need of heating and air conditioning services without hesitation. In 2000 we had Precision Air install a new heating and AC system in the house we were then living in. This was a switch from oil to gas. We were very pleased with this job so when we needed a system upgrade for the house we were doing for our retirement, we included Precision Air in our bidding process. While they were not the cheapest, we felt that they were very thorough on the estimate and took time to explain all the options. They were also able to supply the latest technology and explain it so that we understood what they were talking about. The house we were working on was a former rental property and in "difficult" condition. The scope of work they performed was to completely install, seal for leaks and insulate, all new duct work, hard pipe all vents through the roof , service and repair the existing gas heater and AC unit which were only about 5 years old, and install the new very high tech thermostat. All the work was then tested by Precision Air and passed by a NJ state inspector to receive all the rebates. All paper work and scheduling was performed by Precision Air. We had as part of the original agreement, decided to use the rebates to pay for and have installed a tank-less hot water heating system.This was also installed by Precision Air, with all vent pipes run through the roof. The whole system install passed local inspection the first time. We found everybody we dealt with to be friendly, knowledgeable and patient. Our contractor was impressed with both the quality and speed with which the work was completed. All phone calls were returned promptly, and the office staff and our installer Chris (whom I'm sure I drove crazy with my questions) were a pleasure to deal with. The system as it stands has been in use since last July so we have experienced both summer and winter conditions and the system works very well and is most economical to operate. We feel that Tom the owner and Pat the service manager did and excellent job of providing a comprehensive set of plans, installing and testing a state of the art system. We both feel that that the value and performance was worth every penny. I am sure you get these emails all of the time but I am completely blown away. I cannot tell you how happy I am about the work that was done here the last 2 days. Christian and his crew far exceeded my expectations with the install and their quality of work. I had a page full of questions and every single one of them was addressed. The work area was left spotless. I still cannot believe the hot water heater/heat pump that you had installed to reduce our energy consumption. One is always concerned when allowing a contractor into their home, but after seeing the work you guys do there are no such concerns. I assure you I will be writing letters to Carrier and GE about your company and crew. I just wanted you to know that it's been just over a year that we've been using our Mitsubishi Ductless units and we are very happy. The heat/air conditioning option worked out very well. We saved a ton of money in the winter by using them in the room my husband uses for his office and not heating the whole house when we didn't need to. They are very quiet and easy to use. Your recommendations were right on point and we will be customers for years to come. Just thought I'd shoot you an e-mail to let you know what an outstanding job Christian and his crew did on installing my new gas furnace and water heater. The men were professional, friendly, worked on task and were careful not to mark my wife's kitchen walls and floor. I plan on being a Precision Air customer for many years to come and would highly recommend Precision Air to my family and friends. As a very satisfied residential customer for nearly ten years, I would not hesitate to recommend Precision Air for heating and cooling needs. The technicians are professional, well trained, courteous, and genuinely nice people. They answer my questions and are respectful of my home and pet family. Phone calls and appointments are handled by pleasant office staff that is always eager to accommodate my schedule. The emergency service I have needed on two occasions has been fast and reliable. I feel secure knowing that my HVAC runs efficiently because of Precision Air and that my home is safe and comfortable. On a scale of one to ten with ten being the best, I would give Precision Air a 10+ as Tom Crammer and his crew were completely professional, transparent, and courteous throughout the process of installing insulation throughout my home. As a result of their professionalism, I had my HVAC system upgraded too! I am very pleased with their work and am happy to recommend them. 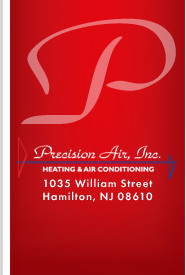 For more than 25 years, Precision Air has taken care of all our needs regarding HVAC. Precision Air's service has always been prompt, efficient and cost effective. We have highly recommend them, and will continue to do so, to anyone thinking of or in need of HVAC equipment and service.